The Bogyoke Aung San Market is a perfect place for tourists to start their visit to Myanmar, not only because it is the best place in town to convert foreign currency, but becuase it gives an idea of what the country has in store. The official exchange rates of the Myanmar kyat is kept artificially strong by the government set rates. This has created a large black market trade in the currency at a much better price for tourists. The best place to change currency is in the central jewellery section of the market; most of the shops provide the service and money exchanging hawkers line the area waiting for tourists. To maximize the rates it is best to ask several different vendors and bargain hard. Be careful to count your money and do the exchange math yourself. Exchanging currency on the black market is risky, but many travellers go this route. Once you have converted money the market is a great place to buy crafts, art work, jewellery or antiques. Popular souvenirs include Burmese cigars, and old Burmese currency, some of which was issued in the curious but numerologically auspicious denominations of 35, 70 and 90 kyat notes. 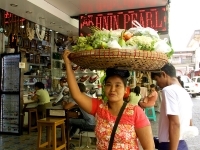 Bogyoke Aung San Market is open daily from about 9am to 5pm and is centrally located in downtown Yangon. Locals will be happy to direct you if you get lost. Opening times: Tuesday to Sunday 10.30pm-5pm, closed Mondays.